We are constantly learning new things during our life and we are leading our upcoming generation to do the same. We are passing on our craft and knowledge further, to our pupils, students, and audience. This is the same as in other expert professions. ALFAVARIA TOOLS container mobile training workshops help train students across the world. Auto-mechanics, farm equipment repairmen, and welders, fitters: thanks to our mobile training centres, they acquire new knowledge, which they apply in independent practice. We consult the draft design and implementation of the training workshop with you, and try to meet all of your needs and wishes. The container mobile training workshop can operate entirely independently. You can simply incorporate it within the learning and training infrastructure – for classrooms, material stocks, facilities for students and lecturers. A large advantage is the option of immediately relocating the training workshop to another field, for example to another field of work or to other areas of study. 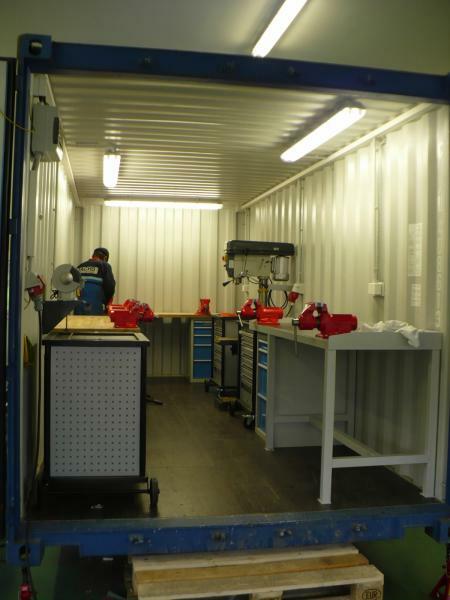 After relocating it to a new location, the container workshop is immediately ready to fulfil its function, perhaps even at the opposite side of the globe. Discover the option of including a training workshop among your existing buildings. Learning work sites for primary school students, grammar school and postgraduate students, mechanics, welders, fitters, etc. Company training centres for on-site experience. Educational and servicing work sites in remote locations and developing countries. Corporate training centre for establishing a new branch. Maintenance and repair facilities for learning equipment, fleet, mechanization. Complete equipment including accessories for studies and training in servicing. We will install the workshop for you in any type of shipping or storage container. Container internal equipment and modifications depend on the study needs and education level of your workers. We also adjust the training workshop to the place of use. Among common adjustments and modifications are wiring, air conditioning, heating, and insulation. We naturally light the workshop through positioning of windows, door, and installation of external and internal lighting. You can select its colour, both of the exterior and interior – for example to match the colours of other buildings or the environment. Look at the list of many other possible modifications of container training workshops. Mobile training workshops are equipped with a wide assortment of tools. We know how to adapt them for any learning, educational, and servicing activity. We place hand, electric, and pneumatic tools in the workshop, along with accessories for welding, a compressor, generator, and many other components. 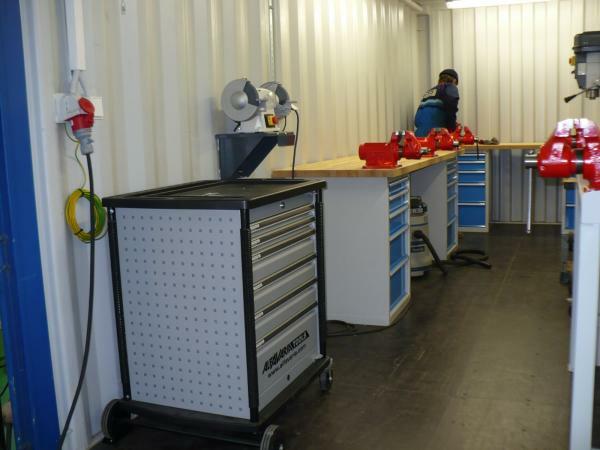 An important factor for designing container workshops for learning and educational purposes is ergonomics and the ability of working with an entire group at once. We pay attention to student and audience safety, who work in the shop. We provide solutions for safeguarding stored material – particularly during transport. 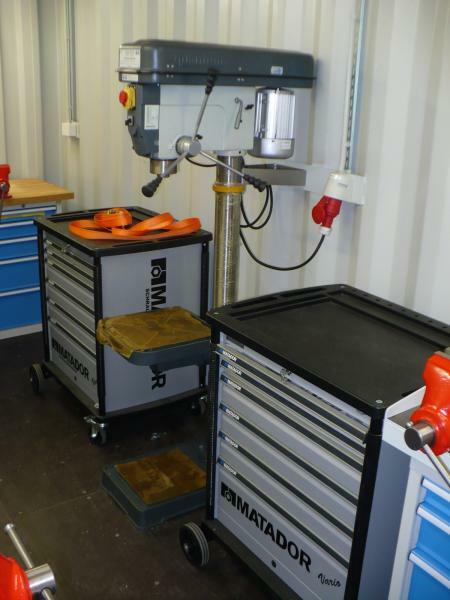 We complement the workshops with high quality professional workshop furniture with many safety features, for example with drawers that extend 100% as well as stops to prevent accidental ejection. 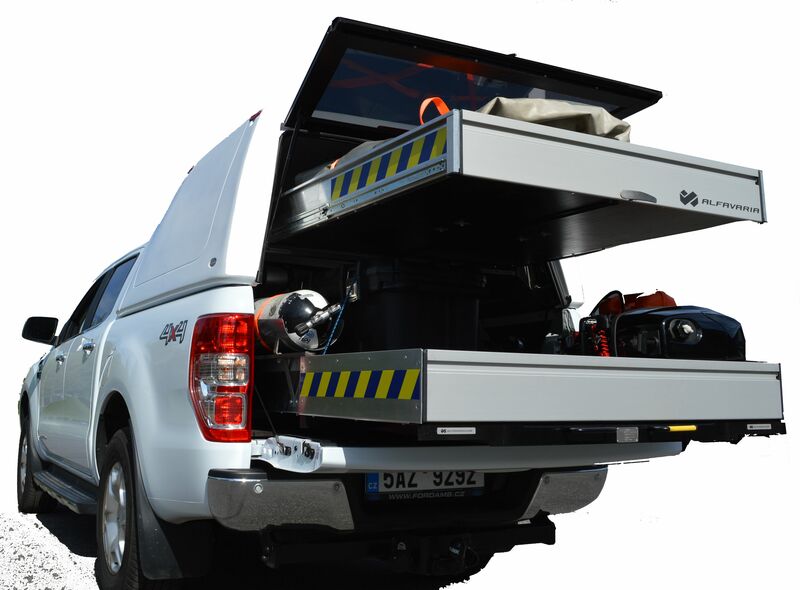 Mobile workshops contain modules for safe placement of material, shelf components with hinged stops. Review the comprehensive overview and workshop furniture options. We design individual solutions for each form of use and consult them with you. We deliver the container training workshop to the negotiated destination. We will teach both you and your lecturers how to fully use the advantages of mobile workshops, which will enable you to pass the knowledge on to your students. Our long-standing experience with delivering tools and workshop equipment for professional and industrial manufacturing makes us uniquely qualified for consultation and designing of suitable tools and equipment. Educational centres from ALFAVARIA TOOLS successfully work across the entire globe, for example in Angola, Africa. We enjoy our work; your satisfaction is our goal.